After living in my Simsbury home for over 20 years, I decided to downsize and move into the new Mill Pond Crossing Townhomes. My only concern was the decision-making required with new construction. However, I had nothing to fear. The builder’s process was so organized and it was simple to choose amongst the standard high quality options. I am extremely happy with how beautiful my home turned out. We are very pleased with our decision to move to Carson Way! Our experience couldn’t have been better – from start to finish. We felt comfortable discussing all of our options with the sales team prior to selecting our site and model, and they were very helpful when we worked thru the various custom option packages. The quality of construction, their attention to detail and all of the finishing touches exceeded our expectations. We’ve been living here for about a little less than a year and love the home and the neighborhood. When I was buying into the Bradford Walk community I wasn't sure what lay ahead; I cared a great deal about the quality of the home I'd be buying, I'd never lived in a condominium community before, and I was making this move as a new resident to the state. What I've learned in these past 1-1/2 years since I took ownership is that I made a wonderful life decision and a wise home investment. Having purchased both a resale and a newly constructed home in the past, I have been nothing short of delighted with my comparative experience as a buyer from Nelson Construction. Not only are the Nelsons and their entire staff caring and reputable professionals but the quality of these structures is superb, the craftsmanship expert, and the integrity of the Nelsons to stand behind their product and this community has continued as ever apparent. We have an elected board of residents who oversees the association management and funding in ways that communicate intelligence, responsiveness, and prudence. And, also highly important but on a more social level, we continue to grow as a strong community of neighbors, respectful yet supportive in ways that make life here a very pleasant experience. I have never regretted my decision, and I actually feel quite fortunate to have chosen Bradford Walk as my new home. The Nelson construction team and all of its subcontractors are a pleasure to work with. They pay strict attention to every detail, from design to construction to follow-up. They truly stand by their product – a rarity in today’s market. 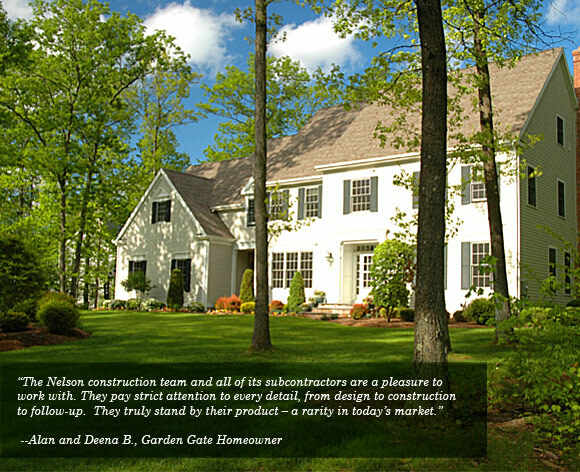 Our experience with Nelson Construction was wonderful. This was our first time building. From design through construction and even after closing their entire organization were professional and a pleasure to work with. Chris and Mary-Ellen showed flexibility through-out the process which made our journey very manageable. We received high quality, value for our investment, and a well planned energy efficient home constructed with many new technologies. We love our new home.